Luggages used to be black holes of clothes and other junk, with the contents inside destined to be jumbled and lost while in transit. Most suitcases are only equipped with basic straps to hold your clothes in place, which really don’t do the job of organizing your gear. But then packing cubes entered the mix. Packing cubes are basically mesh zippered pouches for organizing your clothes and other gear in your luggage. The eBags Packing Cubes are leading the way in the packing cube revolution, being the most popular cubes on the market. eBags Packing cubes come several sets and colors including the basic set which has one large cube, one medium cube and one small cube, the medium set, which has 3 medium sized cubes, and several other sets. 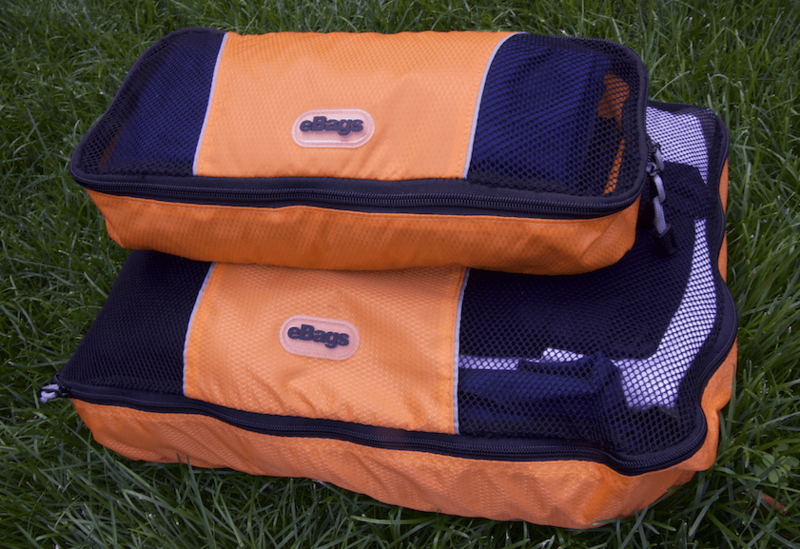 I am reviewing the eBags Packing Cubes Value Set: Packing Cubes + Slim Packing Cubes in orange, which includes 3 basic cubes (one large, one medium and small) and 3 slim cubes. These 6 cubes cover every type of eBags packing cubes, which are all identical in design, except for their sizes. One large sized cube is large enough to hold approximately 6 pairs of jeans. I’m 5’8″ and one large cube almost the size of my torso. One medium sized cube is large enough to hold 3 or 4 pairs of jeans. One slim sized cube is large enough to hold 1 pair of jeans, with a bit of space left over. The slim cubes are smaller than the small sized cubes. The cubes are made of nylon, and have two YKK zippers as well as a carrying handle. I’ve been using the eBags Packing Cubes for over a year, and don’t have any signs of breaking. The mesh material, handles and zippers are sturdy enough to where I’d be comfortable with holding a 15 pound dumbbell inside the cube, and hold it by its handle like a briefcase all day. The most important feature if the packing cubes are their ability to organize clothes and other miscellaneous goods inside of your suitcase. The eBags cubes do a good job at this by allowing you to keep the same types of clothes together, or to organize your outfits. The cubes allow for you to access clothes at the bottom of your luggage without having to dig through everything on top. Also, you can easily take the cubes out of your luggage and hang or place them in your hotel room. 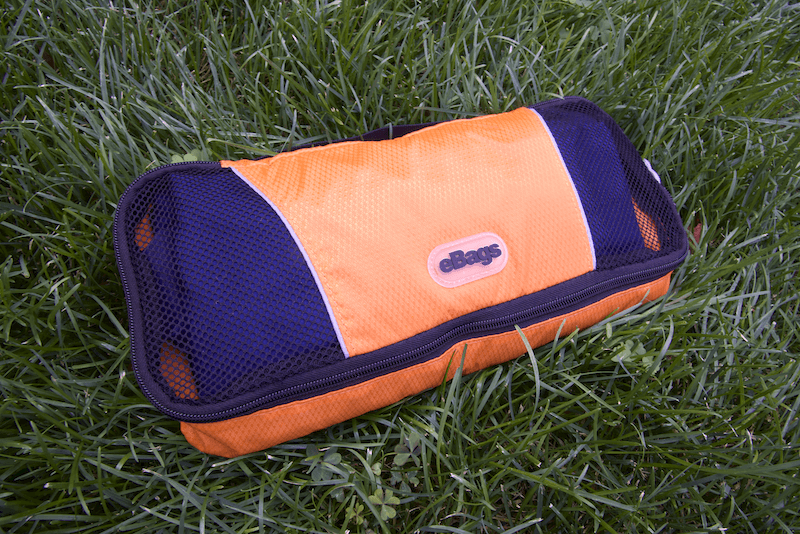 eBags packing cubes come in several bright colors which makes your cubes easy to find. The different colors also allow you to color code cubes with different family members. With its conveniently placed carrying handle, the packing cube could be used not only for travel, but also as a gym bag, a bag for your shoes or makeshift lunch box. The packing cubes are made of thin nylon sheets, making them lightweight. Another useful aspect in the packing cube is the see through mesh, which allows clothes to air out and to be seen without having to open the cube. Some packing cubes, such as the Eagle Creek Pack-It Specter Compression Cubes can compress clothes, via a zipper which is like an inverted expandable luggage zipper that makes the cube smaller when zipped up. The eBags Packing Cubes do not have this feature. While this isn’t a major con, this does annoy me: When you pack the eBags Packing Cubes to the max, they tend to bulge rather than fill the cube shape. This is because the packing cubes are soft and don’t have any firm shape. When the cubes bulge they become more like lopsided ovals with empty space at the sides rather than cubes, meaning that they don’t completely maximize space. Although it is an issue, I don’t think eBags can do anything about it, because firmer packing cubes would be bulkier and cause more problems than they would solve. The main issue with eBags Packing Cubes and packing cubes in general is that they are relatively expensive. Packing cubes cost approximately $10 each, which I think it kind of expensive considering they are simply zippered sheets of nylon. I use my packing cubes often enough to make them worth it, but if you’re only going to use cubes once per year, I don’t think they’d be worth the cost. Not convinced with packing cubes? Check out our top 5 packing cube alternatives. With its impressive organization aspects and light weight, the eBags Packing Cubes are deservedly one of the most popular packing cubes, although somewhat expensive. Compared to other cubes like the Eagle Creek Compression Cubes and the Eagle Creek Pack-It Locker, the eBags Packing Cubes are a more ‘no-frills’ option. 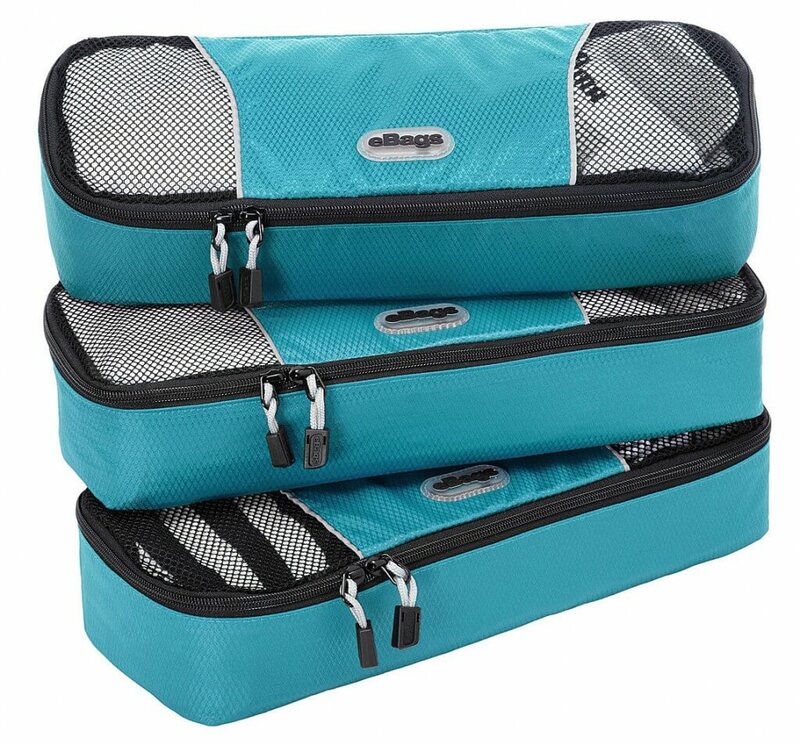 I’d recommend these packing cubes to family travelers, business travelers, vacationers or anyone traveling with a suitcase. Also check out our review of the Eagle Creek Pack-It Locker. Some links found in this post are affiliate links, meaning that I get a commission if you decide to make a purchase, at no additional cost to you. This helps to fund the site 🙂 I would never endorse a product or service I didn’t actually use and believe in. Do you use packing cubes? Why or why not? Leave your comment below. Definitely a +1 from me for the ebags packing cubes. I bought them a couple of years ago and they are amazingly useful. A couple of toiletry bags and we are all set! I even use the smaller options in my carry on which makes it super convenient. Hey Shree – I totally agree, thanks for sharing!